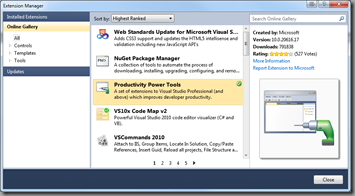 Visual Studio 2010 is one of the best IDE’s I have ever seen and worked with, and provides, out of the box, a truly impressive array of tools to make developers lives easier and more productive. But, as good as it already is, there is still room for improvement. 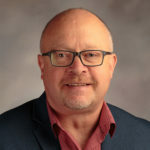 Luckily Microsoft has provided an extensible platform and an easy way for people who develop extensions to be able to publish those extensions to developers. Check out the “Extension Manager” utility that you will find on the Tools menu. The extension manager, as suggested by its name, provides a simple UI which allows you to locate, download and install all kinds of Visual Studio extensions. 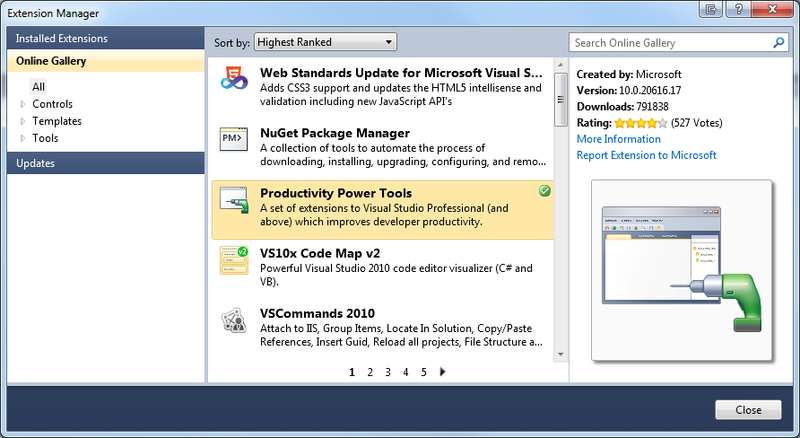 The actual extensions are hosted on-line at a web site called the Visual Studio Gallery. Some extensions are written by Microsoft, some by third-parties. Some provide additional functionality throughout Visual Studio, while some are specific to a particular language. Some add new project or item templates to Visual Studio, while others add complex capabilities in a range of scenarios. I won’t even attempt to go into detail about what these extensions do, because the list of enhancements is a long one. You can click on the hyperlinks above and read all about them in the gallery. Suffice it to say that if for some reason I wind up working on a system other than my own laptop, and these extensions are not installed, I miss them both terribly!